One area of health that it’s important for teenagers to consider is their dental health. A commonly occurring impact of this is the needs to wear braces, which in itself can cause a whole array of issues. Ideally, you will have encouraged your children to take care of their teeth when they’re growing up, by learning to brush their teeth regularly and attending dentist appointments for regular check-ups. It’s a habit you’ll need to keep encouraging as they’re in their teenage years, as dental health is just as important then, and throughout adulthood. Although your children’s teeth may have remained relatively problem-free during the pre-teen years (minus the odd wobbly tooth), in the teen years it’s possible that problems may begin to surface. This doesn’t necessarily mean anything major, but that as all the teeth in the mouth will now have appeared, there may be issues with straightness or overcrowding. In situations like this, your teen may need braces for a while, to help straighten things out. Or, if they’ve sailed through their younger years without the need to ever have a filling, it’s possible they need one as they get older. Like other areas of health, you never know quite what could happen and the best way of ensuring dental health is in tip top condition is to see a dentist regularly. Depending on your dentist’s recommendations, the age of your teen or the state of their teeth, this may be every six months or every year. Whereas you may have always accompanied your child to the dentist, now they’re getting older they may want to go on their own. As independence is important to teens, you should consider putting your trust in them to attend their appointments on their own – it may even have a positive effect of helping them to take more control of their own dental health. Finding out that they’ll have to wear braces can be a bit of a shock to teenagers. It’s not always so much the fact that they’ll need them, but the issue with appearance that worries them. 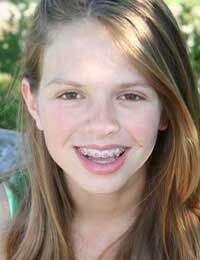 At a time when image is so important and some teens are becoming more self-conscious about themselves, the thought of having to wear braces and be different from their peers can cause a lot of worry and upset. In some cases, it has helped that celebrities are being seen wearing braces in recent years – and if they’re happy to do it, teens are often willing to follow suit. However, if your teen is not quite so keen, some straight talking from either you or the dentist may be required. It may help to emphasise all the benefits of wearing braces, especially in terms of the long term help it can provide teeth. A dentist may be able to show pictures of what can happen to teeth if braces aren’t worn and it’s always good to emphasise that they won’t need to be worn forever. It’s also worth bearing in mind that there are some quite funky braces around these days. Gone are the times of plain metal – now there are colourful options too. So if your teen is worried about looking boring, they could pick their favourite colour and make an individual statement with their braces. Whether or not your teen needs braces or other dental treatment, do try and encourage regular visits to see the dentist, as good dental habits will give them a great boost for adulthood.